Last week we discussed how to edit routes, and more importantly how to dynamically edit route. 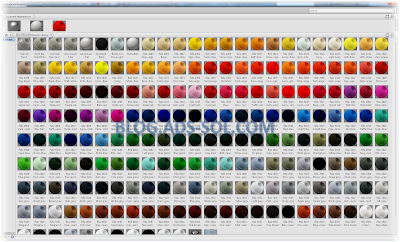 Chris Benner was kind enough to post it on his blog so if you missed it go check it out because there are some nice tricks on speeding up your route editing. As mentioned there, today I will show you a couple of ways to place fittings. You might ask yourself what’s wrong with the normal place fitting command? Using the standard place command is fine when you have all the time in the world to do a route but when it’s hot and heavy and you can’t see the top of the work pile then you might want to read ahead and use some of the tricks bellow to speed things up. Sometimes we’re so busy cutting the forest that we forget to sharpen our axe so if you do speed up your work process with the tips bellow go learn some more, it’s the only way to remain productive and in love of the game. 1 - The first one I shouldn’t even mention really, it’s the standard place fitting command, up in the Route tab or on the right click contextual menu. I will mention it to remind you that you should have a short key assigned to it. I use multi-character commands just like in AutoCAD so PF will serve as place fitting in my case. 2 - The next one on my list would be Content Center (CC) favorites. I have all sort of favorites on my CC grouped by category as fasteners, steel shapes, and T&P which is split once again by material, ABS, PVCU, etc. I use autodrop since its introduction by Mechsoft (anyone still remember it?) 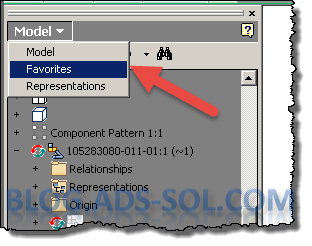 before being acquired by Autodesk so drag drop or double click on the favorites item in the left side pane once you changed from Model to Favorites. 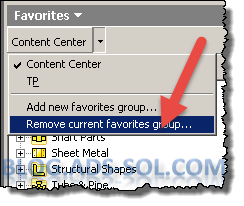 For some reason a guy with too much time on his hand at Autodesk has added the whole Content Center in the favorites (in v2014 I think) making it slower to load so I suggest that you “Remove Current Favorites Group” on CC and leave just your own favorites to speed it up. 3 - For times when I am just starting up T&P and there are no placed fittings that I can reuse I keep a text document open on the second screen. This contains a short list of folder paths for the most commonly used fittings, like ball, butterfly, sample and check valves, pressure gauges, and so on. So I copy the path of the fitting I need from the text document and after typing PF (place fitting) while nothing is selected I paste the path in the browse for fitting window. This speeds up the navigation to the fitting folder where I can double click on the one I need. 4 - If you have already placed a similar fitting inside the T&P assembly then you can change your selection filter to Part Priority (hold SHIFT and press RightClick) and after selecting the desired fitting use PF (my place fitting shortkey) to have it droppable with the mouse pointer. TIP: If you want to place a fitting from a different run use Part Priority and if you need to select one from the current run use Component Priority. Sometimes even f you’re on Part Priority you can’t select parts so to get over this glitch you just need to activate the Part Priority again and it’s working. On the Dynamic Route Edit video in Chris’s blog I mentioned another possibility and it’s one that I use a lot, it’s simple and fast, no fuss no error. - DoubleClick to place fitting. Here’s an image (in case you are to bored to watch the video at the end). And that’s it! Join me next week for a really nice trick on placing pipe clamps and hangers. You won’t be disappointed and I know you’ll find it interesting.